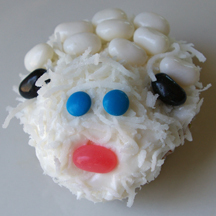 For Easter or anytime, try these fuzzy sheep (or lamb) cupcakes. Or, alter them to make a white dog! What You Need: 1 cupcake; white frosting; shaved coconut (optional); white, black and pink jelly beans (we used Jelly Bellys); 2 blue mini M&Ms. How to Make It: Frost cupcake white. Add dollop or scoop (we used a cookie scoop) to add head near center of cupcake. For sturdier head, you could frost a mini cupcake. Sprinkle with coconut. Add black jelly beans for ears, pink for nose and cover the back with white jelly beans for fleece. Add blue M&M eyes. This entry was posted on Sunday, April 5th, 2009 at 4:01 pm	and is filed under animal cupcakes, Easter cupcakes. You can follow any responses to this entry through the RSS 2.0 feed. Responses are currently closed, but you can trackback from your own site.